The sergeant later admitted to us on camera (not included in these clips) that he had read our material. The public should have no doubt that the OPP is very well aware they have no legal basis for refusing to protect land owners. Video 2: shows the builder asking the natives to leave. They refuse. 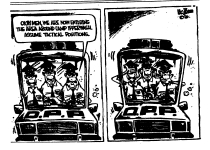 OPP refuse to arrest. 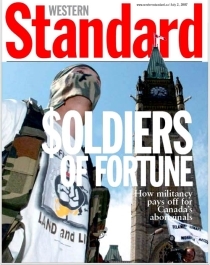 The original video footage from which these clips were taken was used as evidence in private prosecutions by CANACE Executive Director Gary McHale with supporting testimony by CANACE’s Director of Multimedia Production Jeff Parkinson to certify a total of 9 criminal charges against two native protesters for Extortion, Intimidation and Mischief in the Ontario Court of Justice. After CANACE attended the Cayuga development to gather evidence for criminal prosecutions there were no further occupations at the site. There are now people living in the homes. The Crown later dropped the Extortion and Intimidation charges. A motion by Mr. McHale to overturn that decision is currently before the Court. The builders requested that CANACE not commence any actions against OPP officers. In addition to asking CANACE to assist in gathering evidence to lay criminal charges against the protesters the Cayuga builders sought, and received, a strongly worded judgement from the Ontario Superior Court that chastised the Ontario government and rebuked the OPP for abusing their power and discretion in refusing to enforce the law. In a related case, CANACE founders Gary McHale and Jeff Parkinson created important case law when they convinced a Superior Court judge to force a Justice of the Peace to issue process for charges of Mischief against two OPP officers who Parkinson filmed as they assisted native protesters in building a barricade to keep the legal owner out of a Hagersville development site (not owned by the Cayuga builders above). It took a two year court battle with the Crown that resulted in the landmark Superior Court decision in Parkinson v. R, 2009. McHale and Parkinson also overturned a publication ban on the case in Parkinson v. R., 2008. The Crown dropped the charges against the officers after they were issued by the Court despite the video evidence supplied by Parkinson. A second Hagersville developer suffering illegal occupations received a court order declaring that the rule of law is to be respected by all citizens including aboriginal protesters. In this case the protesters had threatened violence if the Court ruled against them. Is it not frightening to think that persons of a particular race with a grievance can just show up at your property, demand money and the title deed without any proof, without ever going to court and obtaining judgement, and the OPP will refuse to remove or prosecute them? 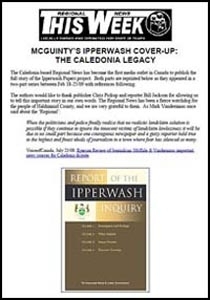 What is remarkable is that the court actions listed above consistently prove that the OPP’s conduct is clearly illegal, yet the McGuinty government justifies its refusal to order the OPP to obey the Police Services Act by saying it is following the recommendations of the Ipperwash Inquiry – a commission that never studied the impact of native lawlessness on innocent third parties! The real estate business, as with all businesses, requires the predictability of the rule of law. According to the judge in the Voortman case cited above the Ontario Court of Appeals ruled in in Isaac v Davey, 1974 that “the combined effect of the Haldimand Proclamation and Simcoe’s Patent did not vest title in the Six Nations people.” He also noted that the two recognized governing bodies of Six Nations have not brought any claim for possession of the Haldimand Tract, only for an accounting of funds that might have been owing. Despite this, Brantford developers, frustrated with the refusal of police to end illegal occupations by militants have now banded together to try to get the City to pay portions of their revenues to Six Nations even though the Supreme Court has ruled that third parties have NO duty to consult or accommodate aboriginal concerns during unproven claims. The Court said that duty and the liability for failing to do so falls on the Crown and cannot be delegated. CANACE editorial, July 13/08: Brantford Builders Aiding in Extortion? CANACE's groundbreaking report that exposes the utter lack of legal justification for abandoning property owners. 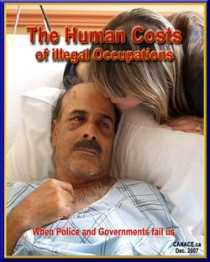 You do not have to submit to the threats, intimidation and costs associated with illegal occupations. 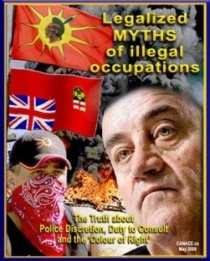 If you are a builder in the Haldimand/Brant area coping with criminal activities by native protesters and police refusal to enforce the law please read the material below carefully, especially the ‘Legalized MYTHS’ report, then contact CANACE at info@canace.ca. 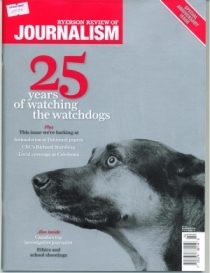 NOTE: Since releasing our MYTHS report in May 2008 CANACE has won 4 cases before the Ontario Superior Court, including the most recent (Dec 31/09) McHale v. Attorney General of Ontario, 2009 [LINK] which ordered a justice of the peace to issue a charge of Influencing Municipal Official against the Comissioner of the Ontario Provincial Police. Another CANACE victory in the area of private prosecution – McHale v. R., 2009 – is under appeal by the Crown. The MYTHS report will be updated and re-released once we know the decision. Oral arguments before Ontario Court of Appeals by both the Crown and Mr. McHale were heard Jan 14/10. It is possible that when CANACE shows up to document the crimes at your site that the protesters will leave as they did in Cayuga. If so, you may be able to avoid the expense of obtaining an injunction however, CANACE is not a substitute for your lawyer. Provide your lawyer with a copy of the Legalized MYTHS report, and of the cases cited above. Consult with them regarding issues associated with CANACE involvement, and follow that advice. You don’t need CANACE to prosecute the crimes, your own lawyer can do so if you wish. I have recently written the minister of consumer and corporate affairs asking if an Ontario land titles system deed issued by the province and on file with the registry is backed up by the Ontario courts and the force of law. I intend to pass along the answer (or non answer) not only to interested local MSM and internet sites but in the investment and business communities in Canada and the US. IF there is no force of law backing Ontario land title deeding why develop or buy here? I think I know what my answer will be, because like the oily lawyers the current regime employs to pour over statutes looking for loopholes to absolve the government from liability or responsibility, I think I found a statute glitch in the land title’s act where enforcement is concerned. It can work for for any deed holder caught between the OPP abandonment of duty to enforce and the government failing to initiate action on illegal claims and trespass. Contact me off line if interested Mark….but being a realtor I suspect you know this. CANACE REPLY: Thank you for your comments and offer. Please keep us informed send any suggestion you have, as well as a copy of any correspondence you receive from the Ontario government. If they don’t answer, contact the Ontario Ombudsman. I wonder how the Walpole Island Natives reactions to Shell Oils new refinery in Sarnia is related to Shells change of heart and calling the project off, how much is this part of the ” if I am not sure who owns the land and is there law to protect that ownership” ? If not, it would be foolish to commit Eight ( 8 ) Billion dollars. I think I am on firm ground thanking McGuinty and his lack of courage for this loss to Ontario’s economic health. Stay tuned folks this is just the start ! CANACE REPLY: Thank you for the comment, Jim. We do not know if Shell’s cancellation of the plan is related in any way to native issues. According to the Financial Post, it was due to poor market conditions and surging construction costs, although the article does say it was opposed by environmental groups.